My goal is to write 1,000 words every day in 2016. In the fall of 2014 I read about a writing challenges by Jeff Goins. 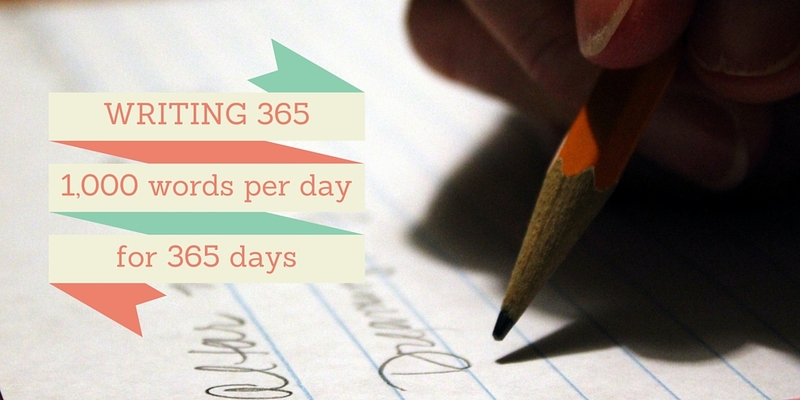 The My 500 Words challenge is to write 500 words per day for 31 consecutive days. Somewhere along the way I translated the challenge into 500 words per day for 120 days, a total of 60,000 words. In Jeff's challenge you can write about anything, and each day's writing can be independent from the day before. However, I decided that I wanted to write a more cohesive narrative over of the course of the challenge. I decided to write a memoir, even though—hopefully—my life is far from over. I made a list of various stories from my life, including childhood, college decisions, professional experiences, and personal mistakes that I overcame. I never planned to publish what I wrote, but it was nice to have a written narrative. Using Lulu's book printing service, I created a print version, which came out to over 200 pages. During the process of writing, I discovered a system that worked for me. The process included creating short-term goals to keep me focused and coming up with incentives to keep me motivated. Most importantly, I really saw for the first time the power of what regular, consistent activity can achieve. I had hoped to keep writing after completing my own version of the challenge, but didn't have any ideas of what to write on a regular basis. Later in 2015 I learned about the 365K challenge, writing 1,000 words per day for an entire year.